Federal authorities have announced that two men, Martin Elze and Gary Boyd, have admitted they took the tusk, cut it up and sold the pieces. Under plea agreements, Elze was sentenced Thursday to a little under three years in prison and Boyd is scheduled to be sentenced next month. Prosecutors filed charges against Elze and Boyd in 2018. The theft happened in March of 2018. According to the plea agreements and sentencing memoranda filed in the case, Boyd, Elze and another person visited the Science Center – owned by the Bureau of Land Management – and their associate asked several questions about the tusk, in a way that made staff uneasy. 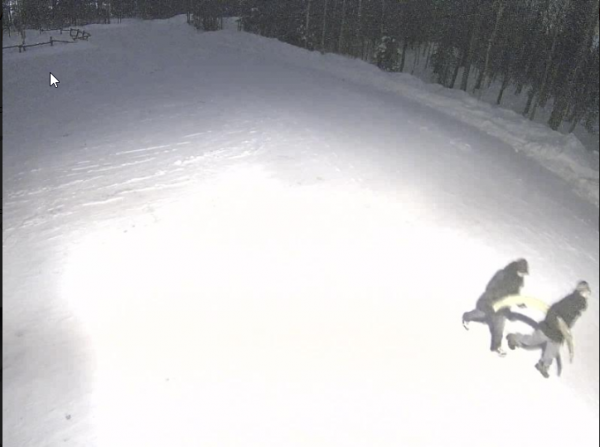 They returned that night and broke a window, according to the court filings, which include a surveillance camera photo of the two walking away, carrying the 100-pound tusk. The federal prosecutor’s court filings do not spell out specifically how a BLM investigator caught onto Elze and Boyd, but the investigator told Elze in a transcribed interview that he had cellphone tracking data and a comparison of their boots to prints found in snow that put them at the crime scene. The tusk, when it was intact, was thought to have been worth between $7,000 and $9,000, though as a paleontological resource, it was considered by some to be priceless. Elze was ordered to pay more than $8,000 restitution in his sentencing. Boyd is set to be sentenced May 15th. The whereabouts of the tusk pieces remain unknown.